Operation Leopard Print | More blue fabric? It’s finished! Or rather, it’s not finished if you read the pattern, but it is if you want to wear it out to dinner on a Saturday night…. Theoretically I should still be adding double breasted buttons on to the cape, but I’m not sure whether I actually want to have buttons on it. They seemed like a really good idea at the time, but now that I’ve discovered the buttons I’ve bought are too big for my one-step buttonholer I’m not so sure (surprise surprise…. ), especially when I realised I could use a fab brooch instead. I might change my mind and go back to it, but for now I’m going to revel in it in all it’s swooshiness*. That and figure out what to do with half a metre of leopard print fur. Maybe trim a wiggle dress for the ultimate fifties look? A LEOPARD PRINT CAPE! Boom! Operation Leopard Print is a success! No. It’s leopard print fur. Just too awesome. 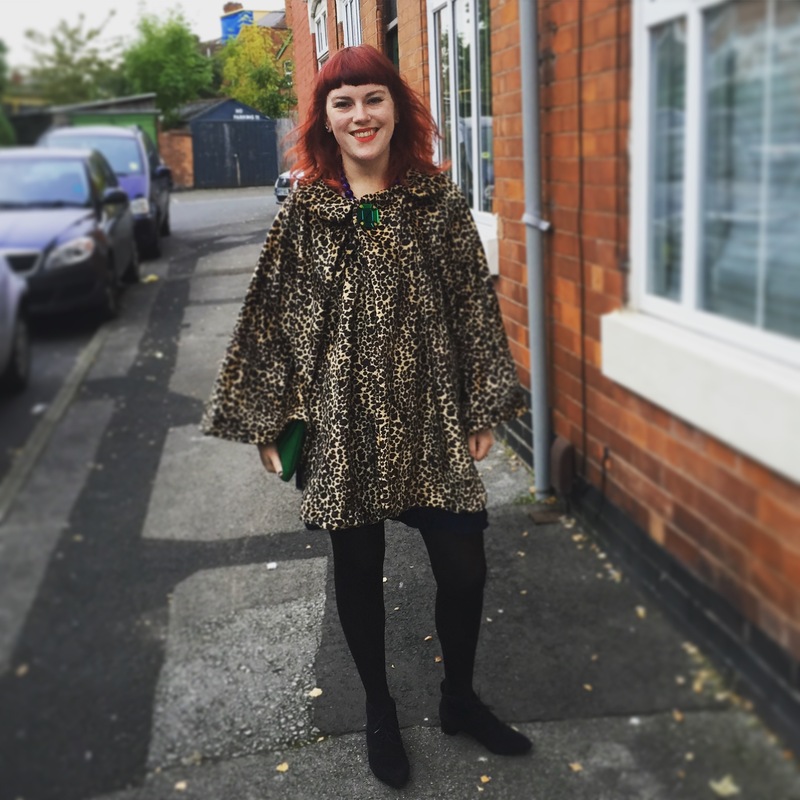 Aside from getting to swoosh about and wear leopard print, the cape itself came together really quickly. I also got to learn to make welt pockets which was a bit of an experience and one I’m pretty proud of. Well there were a couple of things, but the biggest issue was the neckline. I have no idea if I cut the cape pieces too big or misread the seam allowance or what but it ended up being about two inches shorter than the facing and the collar. I managed to bodge it a bit, and thankfully, because it’s a shiny material and is meant to hang you can’t see unless you look closely but that wasn’t great. I even went so far as to get the collar paper piece back out again because I was convinced I must have cut the wrong size. It was also pretty dull to sew together as whilst it was fast it was a lot of long straight lines and the fabric got pretty heavy once it was all connected. Hmm. See, I bought the leopard print to test this out before buying some ludicrously expensive coating material. Except, actually, now I’m not so sure I want one that’s made from coat material. I fancy making one in some sheer guazey fabric for the next time I go to a wedding or posh do (which is not that often if I’m honest) as an alternative to the obligatory pashmina, and I think I’ll probably make one in sequin fabric for next year’s festival season. But a cape in coat material? That will almost certainly be a block colour? Probably navy? It just doesn’t seem fun enough for this pattern. We shall see. *Speaking of swooshiness, of course I had to test out how swooshy it was as soon as the cape pieces were together. And then I had to make a gif of it. Because gifs. < Previous This way madness lies….